Ansonia Clock Co., "Crystal Palace No.2, Extra", ca 1875. 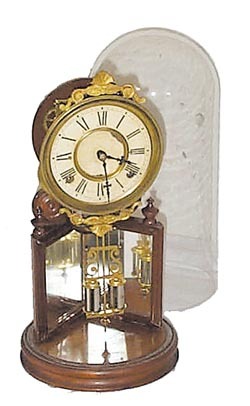 Full label on the back says, "The Crystal Palace Clocks, Davies Sole Man\'f, Patented Jan 26, 1875".Walnut case is 16 1/2 inches high, 17 inches with the glass dome. Pendulum stamped "Davies, Pat d". 8 day spring movement, bell strike. Clock is all original, has not been tinkered with, very nice. Ly-Ansonia, Page 97, same as No.247, No.248 and No.249.